St. Joseph’s Hospital – South’s new patient tower construction will add 210,000 square feet to its Riverview facility. Phase one completion date is late summer this year. Phase two will complete next summer 2020. 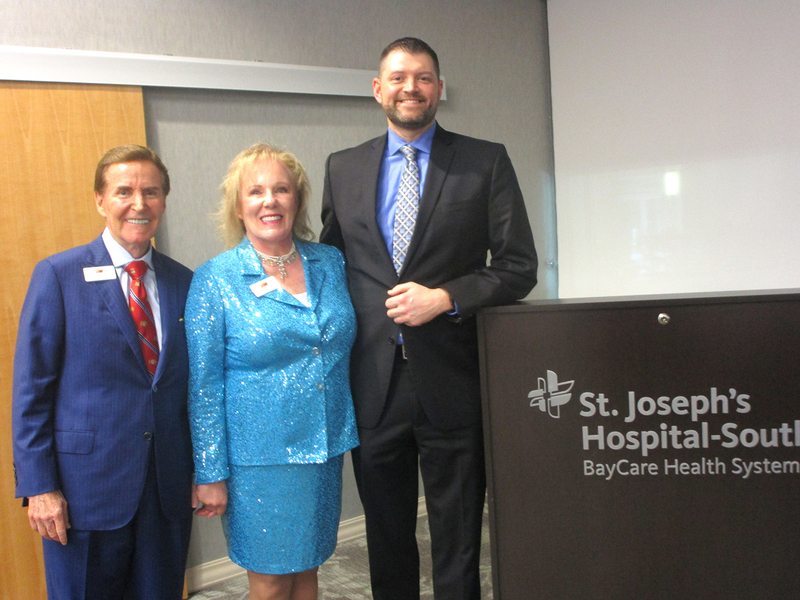 Philip Minden, right, the new president of St. Joseph’s Hospital – South, reviewed expansion plans at a meet and greet recently sponsored by Tom and Robyn Payant and the St. Joseph’s Hospitals Foundation. The Payants are active in the foundation and Robyn is a member of its Philanthropic Women’s group, which helps direct where donations are committed. South Hillsborough County is bursting at the seams. That’s no secret, and with more people comes the need for more healthcare. 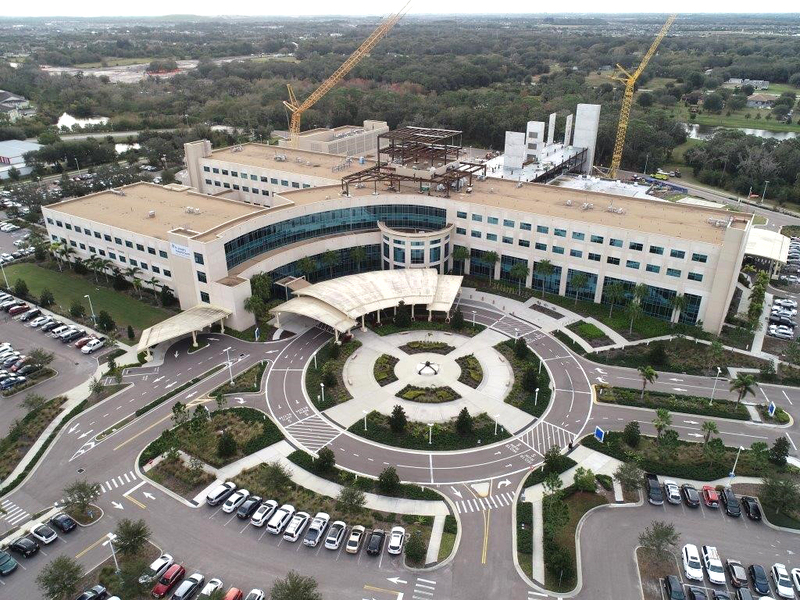 BayCare Health System recognized the demand and opened its first not-for-profit hospital in South Hillsborough County in February 2015. The St. Joseph’s Hospital–South complex was built on a 72-acre site in Riverview off Big Bend Road. Now the hospital is undergoing an expansion that will add 210,000 square feet to its existing 360,000 square feet. Since Philip Minden, the new president of St. Joseph’s Hospital–South, came on board this January from Bartow Regional Medical Center — also a BayCare facility — he has been absorbing input from the community. He learned quickly that St. Joseph’s is important to South Hillsborough County. “Being a full-service hospital, we offer superior care close to home. I’ve been told by the Sun City Center folks that I should build a golf cart path to the hospital,” he said with a chuckle. At a meet and greet at the hospital recently, Minden reviewed the hospital’s growth and expansion underway. In its first year in Riverview, a five-year goal was met and over its four years there, patients served increased 59 percent — from 5,798 to 9,833. The Emergency Department also increased 59 percent — from 40,017 to 68,191. Employees at the hospital now number 840; that’s 42 percent higher than 593 in 2015. The number of babies grew 59 percent as well — from 616 to 1,047. This expansion’s first phase includes building a new five-story South Tower and expanding the Emergency Department. The new tower will connect to the current building in such a way to avoid duplicating functions such as waiting rooms, elevators, etc. This year they will open the tower’s first floor to build out an existing shelled operating room and an existing shelled cardiac catheterization lab. Also, 25 beds are being added to the Emergency Department that includes CT, X-ray and ultrasound capabilities plus an 18-bed observation unit. Phase 2 of the expansion includes three new operating rooms on the new tower’s second floor, build out of third and fourth floors for additional medical/surgical and Progressive Care Unit, pediatrics, along with shell space for 10 future Neonatal Intensive Care Unit beds. They will also add 12 patient beds in the existing mom and baby unit, and shell out the top floor for future expansion. Director of Operations Michael Hance, who is leading the expansion project, said that the current building was actually built with expansion in mind. The hospital’s growth has spurred the need for volunteers. In 2015 they had 42 volunteers when they opened; now there are 140. Manager of Volunteer Resources Kim Wallace said, “St. Joseph’s Hospital-South is an extraordinary place to volunteer! We strive to help make our patients, families and visitors feel welcome and comfortable during their time here. Our community is valuable to our success.” They draw volunteers from all its surrounding communities: Sun City Center, Apollo Beach, Ruskin, Wimauma, Riverview, Brandon, etc. To learn more about volunteer opportunities, visit BayCare.org or email Kim.Wallace@baycare.org. To learn more about St. Joseph’s Hospital–South, visit www.baycare.org/hospitals/st-josephs-hospital-south.